To get these measurements it is absolutely necessary to work at a tension to produce 7½ stitches to the inch in width, measured over stocking stitch. ** 1st row: Slip 1, knit plain to end of row. 2nd and alt rows: Like 1st row. 3rd row: Slip 1, K2, * yo, K2tog, K4, rep from * to last 4 sts, yo, K2tog, K2. 5th row: Slip 1, * K2tog, yo, K1, yo, K2tog, K1, rep from * to last 6 sts, K2tog, yo, K1, yo, K2tog, K1. 9th row: Slip 1, K5, * yo, K2tog, K4, rep from * to last 7 sts, yo, K2tog, K5. 11th row: Slip 1, K3, * K2tog, yo, K1, yo, K2tog, K1, rep from to last 3 sts, K3. Rep. from ** to ** twenty-four times, then rows 1-8 incl. once. Cast off. 2nd and alt rows: Knit plain. 9th row: Yo, K1, (K2tog, yo) three times, K1, inc once in last at. 11th row: Yo, K1, (K2tog, yo) three times, K3, inc once in last at. 47th row: Yo, (K2tog) twice, (yo, K2tog) three times, K10, (yo, K2tog) three times, K3, yo, K2. 81st row: Yo, (K2tog) twice, (yo, K2tog) three times, K10, (yo, K2tog) three times, K2, yo, (K2tog) twice, yo, K1, yo, (K2tog) twice, yo, K1, yo, (K2tog) twice, yo, K1, yo, K2tog, K1, inc once in last st, (47 sts). 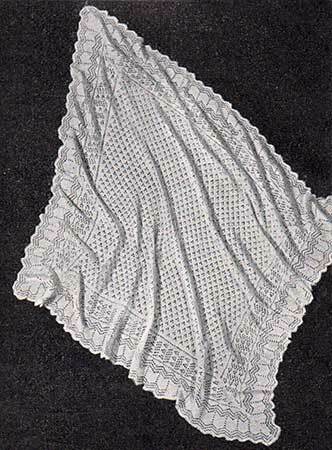 ** 82nd row: Knit plain. Rep. from ** to ** nineteen times. 1st and alt rows: K2tog, knit plain to end of row. 2nd row: Yo, (K2tog) twice, (yo, K2tog) three times, K10, (yo, K2tog) three times, K1, yo, K2tog, K17. 4th row: Yo, (K2tog) twice, (yo, K2tog) seventeen times, K6. 6th row: Yo, K1, (K2tog, yo) three times, K10, (K2tog, yo) three times, K2, yo, K2tog, K1, (yo, K2tog) five times, K4. 8th row: Yo, K1, (K2tog, yo) three times, K10, (K2tog, yo) three times, K3, yo, K2tog, K2, (yo, K2tog) five times, K2. 10th row: Yo, K1, (K2tog, yo) three times, K10, (K2tog, yo) three times, K4, yo, K2tog, K13. 12th row: Yo, K1, (K2tog, yo) three times, K10, (K2tog, yo) three times, K5, yo, K2tog, K2, yo, K2tog, K8. 14th row: Yo, (K2tog) twice, (yo, K2tog) three times, K10, (yo, K2tog) three times, K3, yo, (K2tog) twice, yo, K1, yo, K2tog, K6. 16th row: Yo, (K2tog) twice, (yo, K2tog) three times, K10, (yo, K2tog) three times, K2, yo, (K2tog) twice, yo, K1, yo, K2tog, K5. 18th row: Yo, (K2tog) twice, (yo, K2tog) three times, K10, (yo, K2tog) three times, K1, yo, K2tog, K9. 20th row: Yo, (K2tog) twice, (yo, K2tog) thirteen times, K6. 22nd row: Yo, K1, (K2tog, yo) three times, K10, (K2tog, yo) three times, K2, yo, K2tog, K1, yo, K2tog, K4. 24th row: Yo, K1, (K2tog, yo) three times, K10, (K2tog, yo) three times, K3, (yo, K2tog, K2) twice. 26th row: Yo, K1, (K2tog, yo) three times, K10, (K2tog, yo) three times, K4, yo, K2tog, K5. 28th row: Yo, K1, (K2tog, yo) three times, K10, (K2tog, yo) three times, K5, yo, K2tog, K4. 30th row: Yo, (K2tog) twice, (yo, K2tog) three times, K10, (yo, K2tog) three times, K3, yo, K2tog, K3. 32nd row: Yo, (K2tog) twice, (yo, K2tog) three times, K10, (yo, K2tog) three times, K2, yo, K2tog, K2. 34th row: Yo, (K2tog) twice, (yo, K2tog) three times, K10, (yo, K2tog) three times, K1, yo, K2tog, K1. 36th row: Yo, (K2tog) twice, (yo, K2tog) eleven times, yo, K2 . 38th, 40th, 42nd and 44th rows: yo, K1, (K2tog, yo) three times, K10, (K2tog, yo) three times, KA. 46th row: Yo, (K2tog) twice, (yo, K2tog) three times, K10, (yo, K2tog) three times, K1. 50th row: Yo, (K2tog) twice, (yo, K2tog) three times, K10, (yo, K2tog) twice. 52nd row: Yo, (K2tog) twice, (yo, K2tog) nine times. 54th, 56th, 58th and 60th rows: Yo, K1, (K2tog, yo) three times, K13 . 62nd row: Yo, (K2tog) twice, (yo, K2tog) three times, K10. 64th row: Yo, (K2tog) twice, (yo, K2tog) three times, K8. 66th row: Yo, (K2tog) twice, (yo, K2tog) three times, K6. 68th row: Yo, (K2tog) twice, (yo, K2tog) five times. 70th, 72nd, 74th and 76th rows: Yo, K1, (K2tog, yo) three times, K5. 78th row: Yo, (K2tog) twice, (yo, K2tog) three times, K2. 80th row: Yo, (K2tog) twice, (yo, K2tog) three times. 82nd row: Yo, (K2tog) twice, (yo, K2tog) twice. 86th row: Yo, K1, K2tog, K1. 87th and 88th rows: Knit plain. Work three more pieces in same manner. Using a flat seam, sew borders in position along each side of centre, joining together at corners.